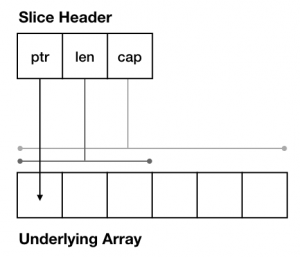 This blog post was inspired by a conversation with a co-worker about using a slice as a stack. The conversation turned into a wider discussion on the way slices work in Go, so I thought it would be useful to write it up. They have a fixed size; int is both an array of 5 ints and is distinct from int. Assigning one slice variable to another does not make a copy of the slices contents. This is because a slice does not directly hold its contents. Instead a slice holds a pointer to its underlying array3 which holds the contents of the slice. In this example a and b share the same underlying array–even though b starts at a different offset in that array, and has a different length. Changes to the underlying array via b are thus visible to a. In this example a is passed to negateas the formal parameter s. negate iterates over the elements of s, negating their sign. Even though negate does not return a value, or have any way to access the declaration of a in main, the contents of a are modified when passed to negate. This is important because unlike map and chan types slices are value types and are copied when assigned or passed as arguments to functions. To illustrate this, programmers instinctively understand that square‘s formal parameter v is an independent copy of the v declared in main. So the operation of square on its v has no effect on main‘s v. So too the formal parameter s of double is an independent copy of the slice s declared in main, not a pointer to main‘s s value. The slightly unusual nature of a Go slice variable is it’s passed around as a value, not than a pointer. 90% of the time when you declare a struct in Go, you will pass around a pointer to values of that struct.5 This is quite uncommon, the only other example of passing a struct around as a value I can think of off hand is time.Time. It is this exceptional behaviour of slices as values, rather than pointers to values, that can confuses Go programmer’s understanding of how slices work. Just remember that any time you assign, subslice, or pass or return, a slice, you’re making a copy of the three fields in the slice header; the pointer to the underlying array, and the current length and capacity. Starting from main we pass a nil slice into f as level 0. Inside f we append to s the current level before incrementing level and recursing. Once level exceeds 5, the calls to f return, printing their current level and the contents of their copy of s.
You can see that at each level the value of s was unaffected by the operation of other callers of f, and that while four underlying arrays were created 6 higher levels of f in the call stack are unaffected by the copy and reallocation of new underlying arrays as a by-product of append. This entry was posted in Go, Programming and tagged slices on July 12, 2018 by Dave Cheney.